Increases circulation and helps to lower blood pressure. Promotes positive thought and a sense of well-being. Speeds up rehabilitation and recovery from injury; many physiotherapists, chiropractors and osteopaths recommend massage to be integrated within a course of treatment. Can ease migraine/tension headaches, eczema, asthma, arthritis, back aches, hormonal imbalances, repetitive strain injury, sciatica, digestive disorders, IBS, insomnia, circulation problems associated with diabetes, lymphoedema and depression. Encourages the release of endorphins, the body’s feel good hormones. Regular massage, alongside exercise and a balanced diet, helps maintain good health and mental well-being. General massage increases fluid circulation which helps speed up soft tissue repair. Aching muscles generally indicate microscopic, temporary damage. This de-toxification process can reduce pain and generally leads to deep relaxation. Remedial, Sports and Deep Tissue Massage target particular inbalances caused by recent or old injuries. This enables the body to function better. Our body's cells need a constant supply of blood carrying everything needed for repair and nutrition. Cells also need to get rid of waste materials. Massage has a pumping effect, stimulating the circulation and so increasing the supply and removal of these substances. This action enables the body to function and heal more efficiently. Massage breaks down adhesions caused by scar tissue and compacted tissue. The lymph system carries waste materials to lymph nodes which filter out toxins. Body movement fuels this action. 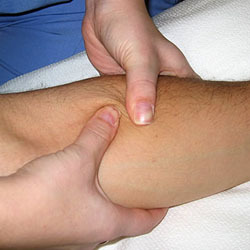 During long periods of inactivity, damage or surgery such as amputation or masectomy, the fluid will collect and cause swelling (lymphoedema) Massage helps to drain excess fluid relieving pain and reducing swelling. Ankle oedema can also be effectively treated. Intense physical activity, or over exertion, causes microscopic tears in the muscle fibres. Delayed onset muscle soreness (DOMS) happens during the body's repair process. Massage speeds this up. Muscle damage leading to aches can also be caused by poor posture while sitting, standing or sleeping, viruses, flu, arthritis, depression and anxiety. It strengthens and tones different muscle groups by moving, flexing and stretching them. It softens tissue surrounding an injury site encouraging the muscoloskeletal structure of the body to re-align naturally. Massage relieves emotional stress by allowing complete relaxation in a safe environment and releases physical tension which together aid restful sleep. It promotes a feeling of well-being and positive self-awareness through a nurturing sense of touch.